It's 10:30pm and I just finished making those few last minute changes to my plans for tomorrow. Ordinarily I'm finished well before this time but tonight we had a dinner guest and so I didn't get started until well later than usual. Still. It's 10:30pm. Past this little duck's bedtime on a school night. I know I'm not the only teacher who comes home and packs in another couple of hours. It's one of the reasons I describe teaching as a lifestyle instead of a job. It's a great lifestyle if you ask me though... How many other adults get to count reading picture books as work? For someone like me (picture book LOVER), it's the icing on the best cake ever. My last minute changes tonight were focussed on my need to do a narrative structure pre-assessment, and a prior knowledge of natural disasters of my kidlets tomorrow. I had things planned but with one thing and another (read that as I forgot that I am being released for an extra lesson tomorrow because of a leadership role I've taken on) I need to rearrange my day and the previous plan wouldn't work. Back to the planning book! I've decided to present out the text of one of my all time favourite picture books and have the kids mark it up. 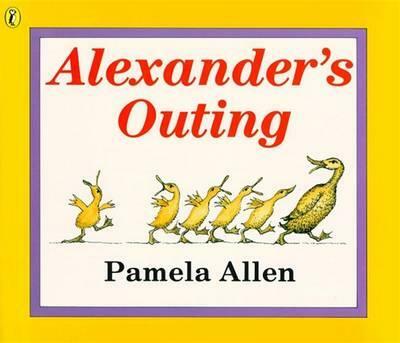 Pamela Allen's Alexander's Outing is perfect for early discussions about narrative structure because it has all the features. And the illustrations are BEAUTIFUL. Win! The natural disaster session is a little more difficult because I won't be in the classroom. I completely trust the teacher who's going to cover me, but as we all know from previous posts - I'm a control freak. So I've set up a padlet for my class to use after the initial conversations. My class used it in a few different ways last year, so I'm hoping my 'loopers' remember and can mentor the others. Padlet is such a fun way of sharing ideas and collaborating, and it's free which is, as we all know, an ENORMOUS advantage. Depending on when you read this blog, you may see my students' comments on the padlet below. P.S. Thanks for the inspiration to blog again and go back to reading teacher blogs for inspiration. Hi Adrienne! Thanks for reading (and commenting)! Off the top of my head the only PB I can think of about world biomes is probably a little young but I'll include a link anyway. I've also asked our TL for you and will pass on any ideas. In the circumstances of certain types of natural disasters it is an effective survival strategy to duck. I like ducks.